2014 was a very “Happy” year for Pharell Williams, but due to being on the wrong end of a lawsuit over his Robin Thicke collaboration, “Blurred Lines,” the artist has been off to a dismal 2015. While that may have put a damper on his hot streak, a bright spot occurred today (April 1) when he was honored in the form of a wax statue at Madame Tussauds in New York City. 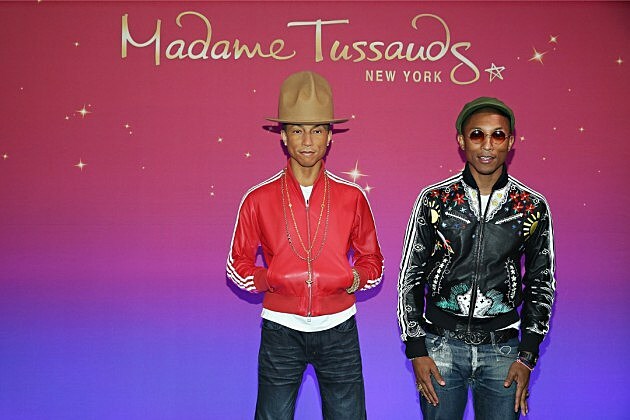 “So our Pharrell figure that we just launched today features… our artists have replicated the famous look from the 2014 Grammy Awards, hich features the signature look of the mountain hat, which was donated by Vivienne Westwood. He’s also wearing the red leather jacket that he performed in at the Grammy’s. And he has jewelry featured that was designed by Damien Hirst,” stated Bret Pidgeon, TO Regional General Manager in charge of Madame Tussauds New York City and Washington D.C. locations. There are few things as big as getting a wax statue made in your likeness, especially when it’s displayed at Madame Tussauds. Any run-of-the-mill artist doesn’t get that privilege and it’s usually reserved for entertainers of the highest caliber, which Pharrell is certainly regarded as in the world of hip-hop. Other artists that have are featured in the New York location are Alicia Keys and even the late, great Notorious B.I.G. Rihanna has been lucky enough to receive more than one wax figure. If you’re ever in the New York City area and feel like taking a selfie with the man who made some of your favorite jams, you know exactly where to go to make that happen.